The pregnant mommy Ava is going to give birth soon, so you have to take care of all the needs of the pregnant lady. Ice Mommy NewBorn Ava Baby Grown Day Care is one of the best baby birth and care game, here you can perform tons of various educational tasks. So use your caring skills in this baby birth and care & complete all the tasks & help Ava with all the different help that she needs. Mommy is pregnant so she cannot clean the room. So you need to help her to clean the room by putting some items in the appropriate basket. The room is totally messed up. All the things are here and there in the room. You need to remember that every item should be put in the right basket. So help this pregnant lady in this room cleaning game and clean the room properly. Pregnant Mommy has a long list of shopping. But to shop these things, she needs to earn some money. So here in this game for girls, your duty is to help her to earn some money and amount should be more because her shopping list is long. So earn as much as you can. Then you need to help her to shop her list. The whole family is going somewhere for a change. You need to help all of them to pack their bag. Because she is not able to do all the things on her own. Put all the things in the bag which she wanted to carry with her. Like dresses, glasses, small bag. Then pack the bag for her husband and pack their bags without missing anything. Mommy is gone for the regular checkup. But she is feeling so nervous and in so much fear. Because it's her first baby. 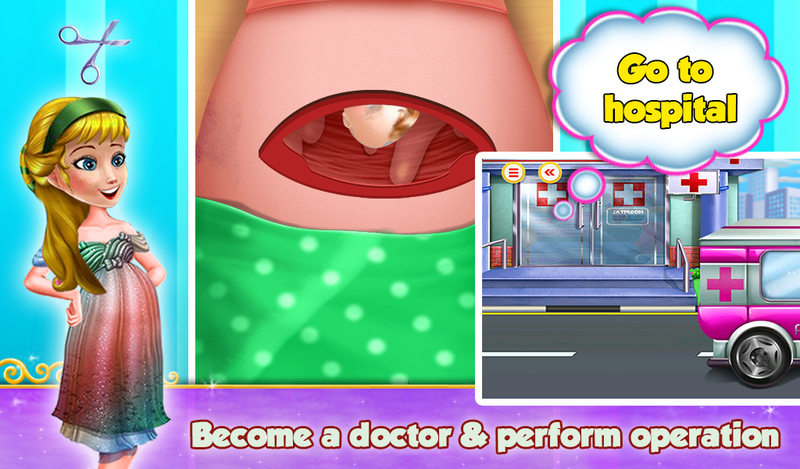 So let's do checkup for mommy in this pregnant mom take care game. Give her some tablets, check her blood pressure, then apply some gel on her tummy, don't forget to give her proper oxygen and check the baby whether she is good or not. Baby is about to born so mommy wants to decorate the room for the baby. She wants everything in the room before the baby born. Use your decorating skills & Help her to decorate the room with a beautiful wall, curtains, mosquito protection, a beautiful bed for newborn baby, a wind-chime and a chair with cushion. Decorate the baby's room beautifully. Oh!! Mommy is feeling uncomfortable and restless. Let's call the ambulance. Mommy will need certain things before an ambulance arrives. She will need water, oxygen mask and her husband to be there. She needs all the things. So give whatever she needs otherwise her life can be in a danger. It's the time to be a doctor and give the birth to a beautiful baby. Start the surgery by applying the antiseptic liquid on her tummy, then give her the anesthesia injection, make a mark for the cut, make the cut using a scalpel and give birth to the beautiful baby. Mommy needs some help to take care of the baby. Help her on this one. Clean the swat using towel then give the baby injection and test the blood group of a newborn baby and lastly check her heartbeat that it is normal or not. Capture the amazing photos of the newborn baby with their parent. Take the best photos of this beautiful family. And give them a beautiful memory of this beautiful baby. Play and enjoy this New Born Ava Baby Day Care game and share it with all your friends and family members.